A History of George Mason University | George Mason University Nobel laureate, Dr. James M. Buchanan, speaks at Press conference, October 17, 1986. Photograph of Nobel Laureate, James M. Buchanan at a press conference in George's Hall on the Fairfax Campus of George Mason University on October 17, 1986. 8" x 10" print; black and white. 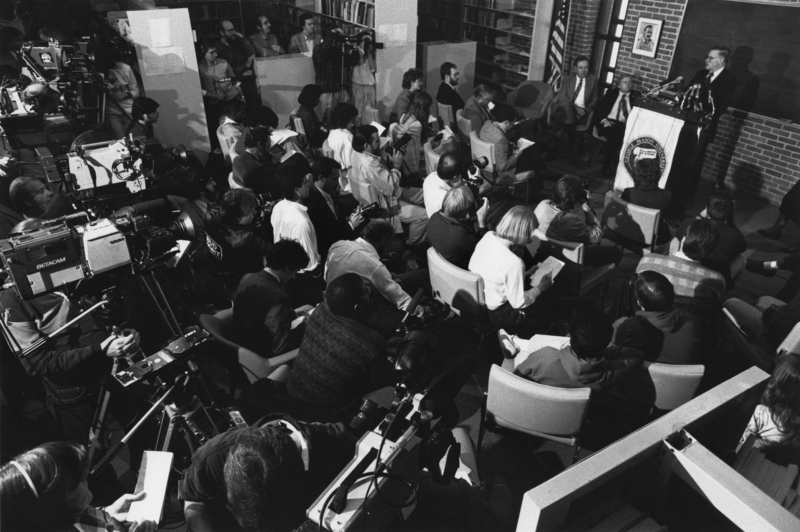 Citation: George Mason University, “George Mason University Nobel laureate, Dr. James M. Buchanan, speaks at Press conference, October 17, 1986.,” A History of George Mason University, accessed April 23, 2019, http://ahistoryofmason.gmu.edu/items/show/245.